Summon: If you have more health than your opponent, the next card you play this turn costs 6 less. Soulrest Marshal is a rare Agility creature card. It is part of the Core Set. 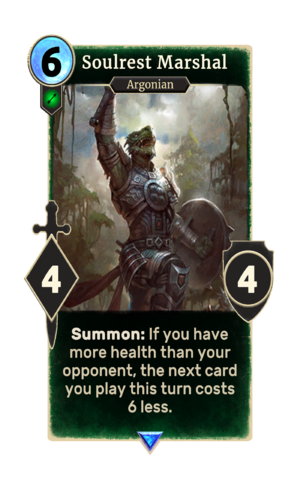 In addition to the card's availability in the Core Set, one copy is included in the Black Marsh Smugglers deck, one copy in the Dunmer Avengers deck, and one copy in the Hlaalu Schemes theme deck. Prior to January 2017, this card had a cost of 5 and reduced the cost of cards by the same value. Both of these values were changed to 6 due to providing board advantage at too early a stage of the game. This page was last modified on 15 February 2019, at 14:06.